If a tent gets taken down in the forest, will it get its own hashtag? Ron Kampeas wondered about a month ago why North American Jews did not have anything really substantive to contribute to #j14… when, according to a Forward editorial, it could have easily been an inspiration to a generation of increasingly disaffected young folk. 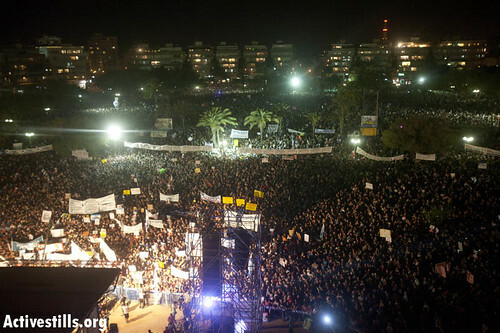 But before N.American Jews could get rightfully excited over the events in tents across Israel, the rally of 450,000 in Tel Aviv on Saturday night marked the official disbanding of #j14 tent protest movement. Tel Aviv’s Kikar HaMedina did not end up being Israel’s Tahrir Square in that it did not bring Bibi or his government down. But #j14 might become something else… a resurgence of a voice seemingly long forgotten, the call of the prophets seeking justice for the workers, the strivers, the poor and the vulnerable. Perhaps a new hashtag is in the offing… #tzedekhevrati anyone?